Editor’s note: this is the second article from MED-EL Listening and Spoken Language Specialist Donna Sperandio. Last week, she explained what a First Fitting is, and this week we’ll move right on to the best part of a hearing implant: hearing! Earlier we explored what happens during your first fitting, when you can use your CI for the first time to hear sounds. There are lots of different sounds, and some of the most challenging (but enjoyable) for CI recipients can be the sounds of music. But, it doesn’t have to be difficult! I’ve put together some tips and information that you can use to listen to and understand music wherever you are on your hearing journey. Early in your hearing journey, music with heavy beats, like a bass guitar line or percussion instruments, is easier to follow than music with wind or string instruments. Similarly, low-pitched male singers like Johnny Cash might be easier to understand than female singers. Music with solo instruments, or solo singers, is usually less complicated and therefore clearer than music with multiple voices or a large orchestra. 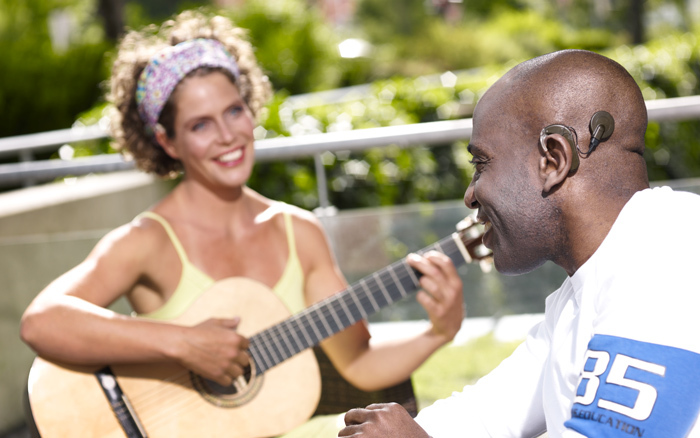 If you listened to music before receiving a cochlear implant, pick out some of your favorite songs that you remember. Listening with a CI will help to trigger your memories of the song, so that you use both your hearing and your memory to understand the music. The first step is to stay positive! Know that by having a positive attitude and actively working on listening to music, you can improve your skills. Start small: by incorporating music into your daily routine, listening to music can become a normal part of everyday life. You don’t have to be in a certain mood or place to listen to music. If you want to listen to music now, wherever you are, just do it! When you do listen to music, it’s good to make sure that you’re hearing the highest possible quality. Laptop or TV speakers usually don’t give a very high quality sound, but by using ALDs like direct audio input or a telecoil, or a wireless induction loop, you can connect directly to the source and enjoy higher-quality music. If you like using headphones, choosing a pair with a large-diameter ear cup that completely encloses your ear and audio processor can help to provide the cleanest sound without intrusive background noises. Speaking of background noise, however and wherever you’re listening, it’s always helpful to keep ambient noises to a minimum. Actually, this is a good idea for anybody who listens to music with or without a cochlear implant. By listening in a quiet environment you can better concentrate on the music and not worry about other sounds. You don’t have to be alone to enjoy music. Actually, being around other people can help increase both your enjoyment and listening abilities. Ask your audiologist if there are music groups available to you. By joining group listening activities, you can talk about and share personal tips on how to listen to music. Maybe somebody else has a tip that you haven’t even thought about. Watching live music can also help, because it lets you both hear and see the music. By watching their gestures technique, you might find it easier to follow along with the music. If there are vocals, reading printed lyrics or subtitles is another great way to combine the powers of sight and sound for more enjoyable listening. Remember, listen often and listen lots. The more you listen to music, the easier it is for your brain to understand the music. And if you ever want to know exactly what the brain looks like when it’s listening to music (or any sounds for that matter), there’s a whole blog post showing how the brain responds to sound.